Games-kids.com is a free online games website that brings you only the best online games, games for every type of person, so that we can mentain all of you happy. We are always glad to see that you like the games that we have to offer and every time we try to make you even happier , and we sure hope to succed. The new article that we have for you is a article dedicated to Subway Surfer, a new category of games that you will love for sure. In the new category that we have to offer, we promise to bring you all the types of games with Subway Surfer including the original ones. We all, know that you like Subway Surfer a telephone game that soon will also be online, only for you. Players of the game take the role of young hooligans who, upon being caught in the act of applying graffiti to a metro railway site. When they apply the graffiti they are always caught in action by the inspector and they run down the tracks to escape the inspector and his dog. The object of the game is to collect coins and other rewards while running through an endless game world and try to get rid of the guard and his dog . Trains and other obstacles must be avoided while running, by performing well-timed jumps, rolls and sideways moves. Occasionally the characters surf on hoverboards, soar over the train tracks and even run along overhead wires. There are also some special missions that reward players with bonuses for accomplishing specific tasks. The game ends when the surfer collides with an obstacle and is apprehended. For use as avatars, Subway Surfers offers regular characters and special characters which are available only for limited time. Jake is the default or best say, the main Subway Surfers character and the face of the franchise. All other characters must be unlocked by gathering a huge amount of coins. This can be done in one of two ways. Some characters are unlocked via the collection of character attributes in the course of the game. An attribute may be an article of clothing or a prop. While the characters, Inspector and dog, chase the main characters, they are always the same characters, only that the insperctor`s uniform changes according to the location. The game is a beautiful one, a game in which you will have to join your friends from the serie. 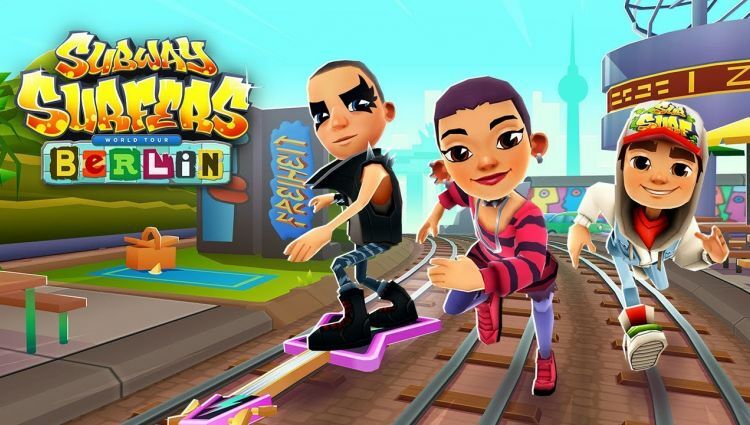 As we have promised we try to offer you a top for all the existing games with the serie of games from Subway Surfers and this time the new game that we have to offer is from the edition, Subway Surfers Rome. As you already know in this time of game it is neccesary to put your mind to it and have fun while you lay with your favourite characters. The game is a very beautiful one in which we are sure that you will have great fun. This time the game brings you an image from the edition Subway Surfers Tokyo and we want you to join us and play it with us. As you can se, this puzzle game is not hard but also it is not easy, exactly like the last ones, where the grade of dificulty is somewhere in the middle. This game offers you the solved image for a few second at the beginning and after you get to analyze it for those few second, the puzzle will shuffle and you will have to start solving it.